Bhagavad Gita Chapter 11: Krishna proves Himself as the Supreme Lord and He establishes the criteria that anyone who claims to be Godhead must also show a Universal Form. Krishna gives Arjuna divine eyes and then reveals His wondrous, effulgent, all-expansive form, and Arjuna sees all soldiers being devoured by His flaming mouth because at that time he was manifest with terrible, scorching rays. 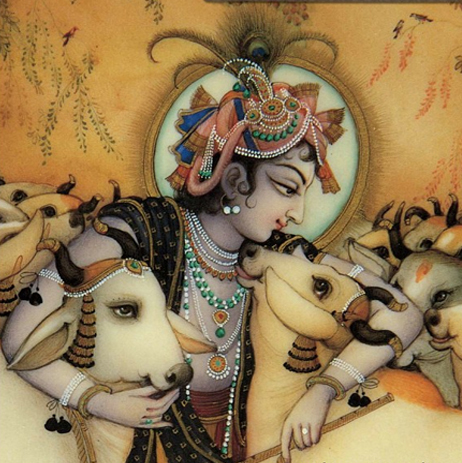 Krishna explains His form as time, the destroyer of worlds, and requests that Arjuna, knowing in advance the inevitable of all the warriors, becomes His instrument. In answer to Arjuna’s fearful prayers, Krishna first shows His four-armed form and then returns to His original two-armed form. Krishna then states that his two-armed form can only be seen by those offering pure devotional service, those who work for Him, who make Him the supreme goal of life, who is friendly to every living being---he certainly comes to Him.